Smokemont Riding Stable offers a safe, fun, family friendly horseback riding experience within the Great Smoky Mountains National Park. Our natural riding trails feature beautiful wooded scenery, native flora and fauna, and mountain streams and waterfalls. • All horses are well trained and experienced mountain trail horses. • Friendly, knowledgeable, experienced guides help make a truly enjoyable riding experience. • Same onsite manager for more than 18 years. Groups are welcome, but please call for reservation or advance notice. 1. Hourly Rides — beginning at 9:00 am and continuing each hour until 5:00 pm. 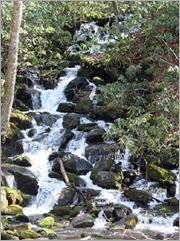 Features include wooded scenery and crossing the Oconaluftee River. Hourly rate: $35 per rider. 2. Waterfall Ride — a 2.5-hour ride departing daily at 9 am, Noon and 3 pm. Features include climbing mountain trail with beautiful scenery and waterfall. Waterfall rate: $87.50 per rider. 4. Four-Hour Ride — Features include wooded trail following along the Oconaluftee River and viewing two cascading waterfalls. 4-Hour rate: $140 per rider. 3. Wagon Rides — Enjoy a peaceful wagon ride going through the forest and along side the Oconaluftee River. All ages. Wagon Rides: $15 per rider. • Riders must be 5 years or older, however there is no minimum age for the wagon rides. • Maximum weight no more than 240 lbs.